Temperament: Shy, but very loving once comfortable. Giada and her newborn kittens were rescued after Giada gave birth on the street. 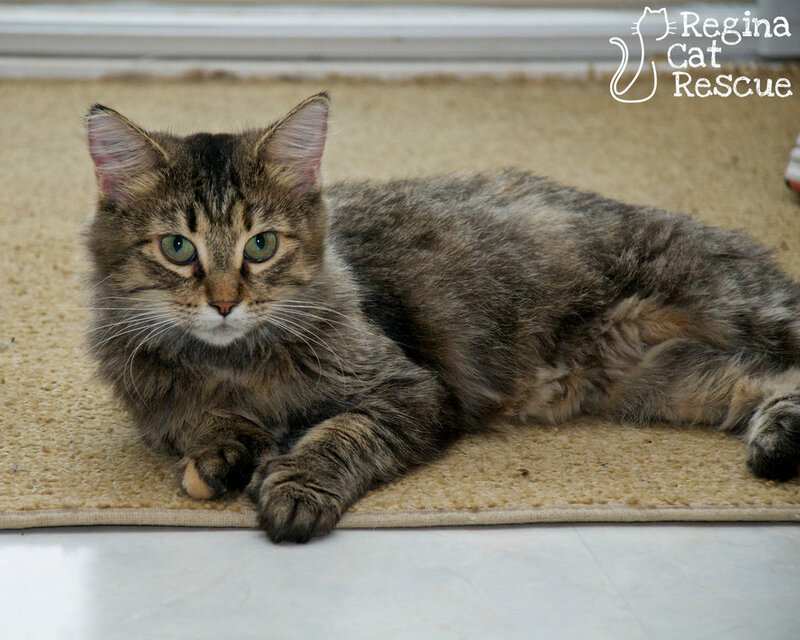 Upon being taken in by the community at Regina Cat Rescue, she and her kittens thrived. Mom had arrived with matted fur and a hungry belly; once she had a good meal and a shave to get rid of the mats, her health has steadily improved. She has been a dedicated mama, and took care of her kittens as best she could. Things have ended happily ever after for Giada’s kittens, as all her babies were adopted. Giada must be one proud mama! Now that the kittens have found homes, it’s her turn. Giada looks great now, and she deserves a place to call her own, with a soft bed and spot in the sun. Sweet and playful, she’s a versatile girl with a big heart. As a cat who gets along great with other cats, she would be happy to share her living quarters with others. She’ll fit in most anywhere, as long as you promise to feed her soft food, which she loves! If you are interested in Giada, click here to view our adoption contract and click here to complete an adoption application or email the RCR Adoption Coordinator at adoptions@reginacatrescue.com for more info.